Let's Rock Like da Vinci - Cook Away! To Share, To Enjoy Life Together. Why not make the "Cooking Adventures" as part of family activities to share, explore, and appreciate the differences... Let's Rock together in the Home Kitchen Lab! Saute mushrooms in the heated butter. Add all ingredients. Cook to evaporate liquid from mushrooms. Cook till they are slightly golden brown. Remove from heat. Add less than half of the cooked mushrooms. Heat through. Remove from heat. Arrange on individual serving plate. Top with mushrooms. Or, Serve as family style on a platter and top with the mushrooms. Add butter to heated saute pan. Add shallots and cook till tender, but not browned. Without removing too much butter out of the saute pan, remove shallots to a small bowl and set aside. Add mushrooms and saute to evaporate liquid. Add shallots to heat through. Add rest of the ingredients. Cook till the sauce is thick and reduced in liquid. Set aside, keep warm. 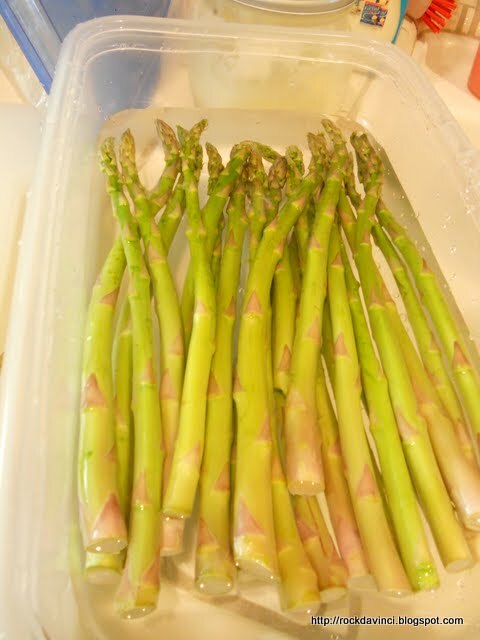 When asparagus is ready, spoon the sauce to the center of the Asparagus. Heat saute pan, add butter, remove butter scum (basically clarify the butter). Medium high heat. Add Asparagus. Saute 1 min. Remove from heat. Arrange an individual size on a serving plate with hollow center for cream mushroom sauce. Extra sauted asparagus? serve it on a platter. Saute chickens in 2 Tb of butter. Add pinch of black pepper and 1/4 tsp salt. Turn it over after one side is seared. Set aside. Saute chopped mushrooms in 2 Tb of butter, 1/4 tsp of salt, pinch of black pepper, 1/2 C chicken broth, 2 Tb extra dry vermouth, 1/4 C heavy cream. Simmer to reduce the sauce until it is thick. Add chickens just to heat through. Remove from heat. Arrange chicken tenders - individual servings on a plate. Arrange some mushroom sauce on top of chicken tenders and dot the plate with mushroom sauce. Serve. 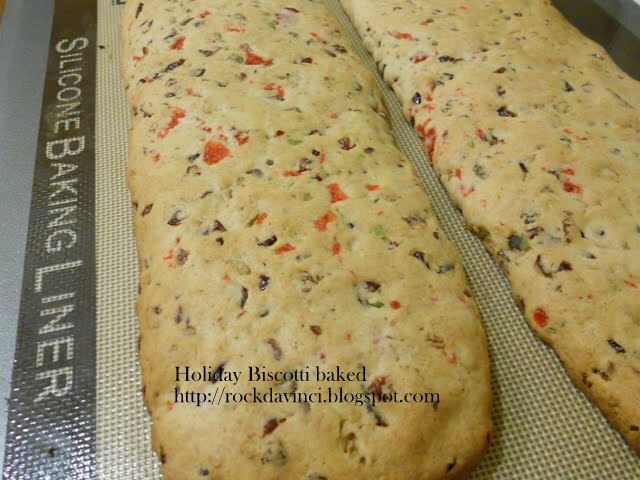 This Biscotti is the same recipe as the other one I posted. Add 10 well drained and squeezed and chopped maraschino cherries. Dip in melted chocolate and coat with toasted almond slivers. 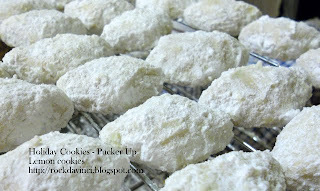 This is lemon cookies. I call it the Pucker Up. Add 1 Tb of lemon zest and 1/4 C lemon juice to the basic cookie recipe. 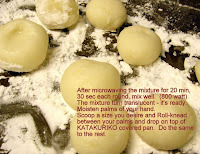 Then, powder up with powder sugar while they are still warm. 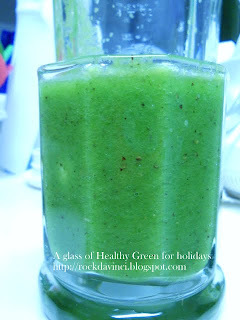 Don't forget to treat yourself to the simple refreshing green drinks. Add all ingredients into a blender to puree. Ho! Ho! HO! and Great Cheers! and a Greetings. 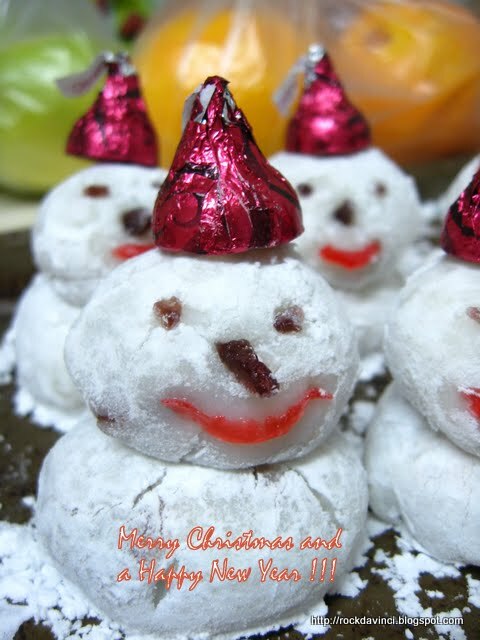 So, it's more fun time in the kitchen with Grand-kids. More wishes and ideas cute cakes and cookies. 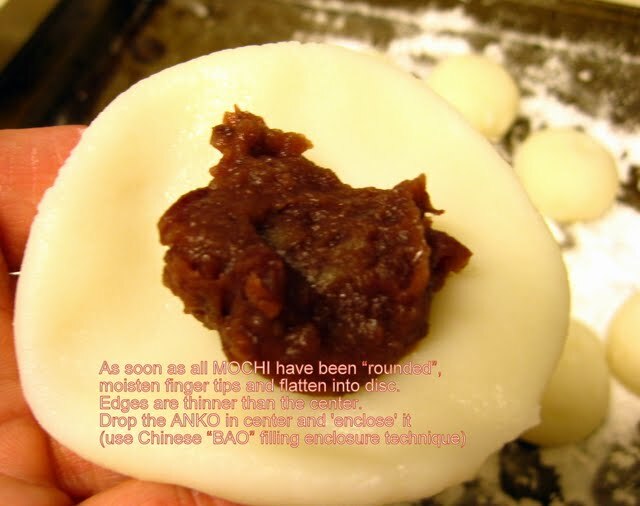 Here is from Good Ole' Japan's DAIFUKU MOCHI. What else can this wonderful be presented other than by itself? hmm... and I came up with the Snowman! 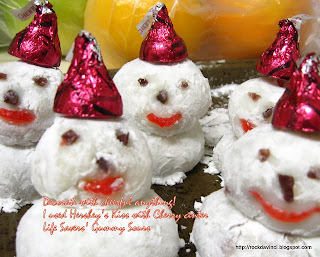 Didn't know what to use to decorate it at first and even went a mile off to shop for gumdrops and so forth, but end up with Hershey's Kiss and Life Saver's Gummy Sours. 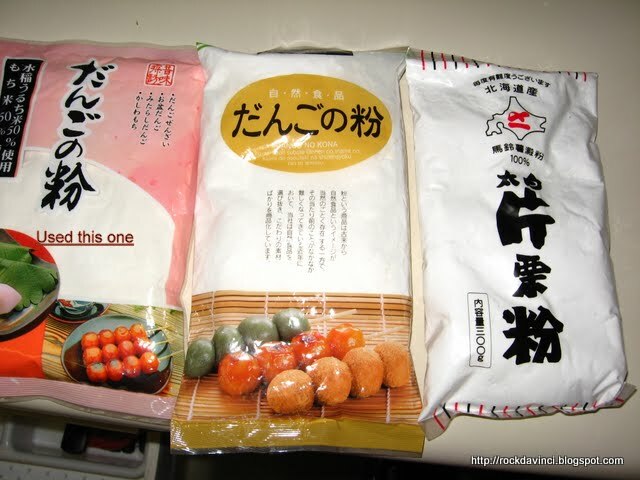 So follow the regular recipe for the DAIFUKU MOCHI in my blog, except that I used the powder form of DANGO powder that I found. Much cheaper than the SHIRATAMAKO. What a fun month is December. 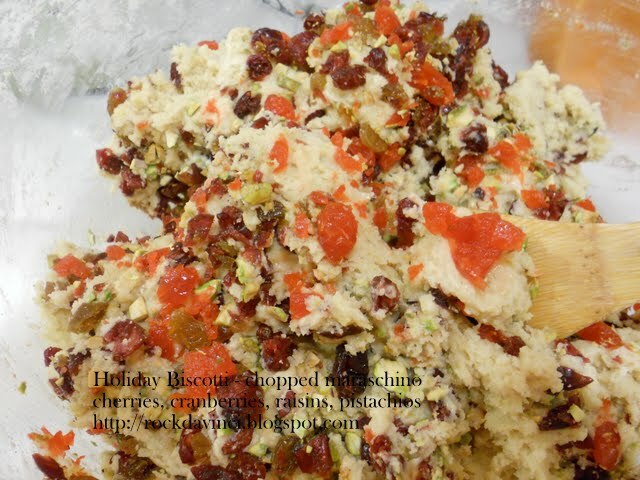 All the shopping fun and cooking and gathering with families over dinner, desserts, and all the wonderful holiday snacks. 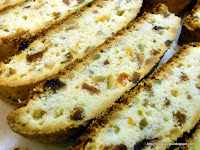 Over the weekend, I made Challah with Raisin, Croissants, and Holiday Biscotti. This time, I managed to obtain unsalted Pistachio at local farm market that it gave me a chance to make this tasty Holiday Biscotti again. 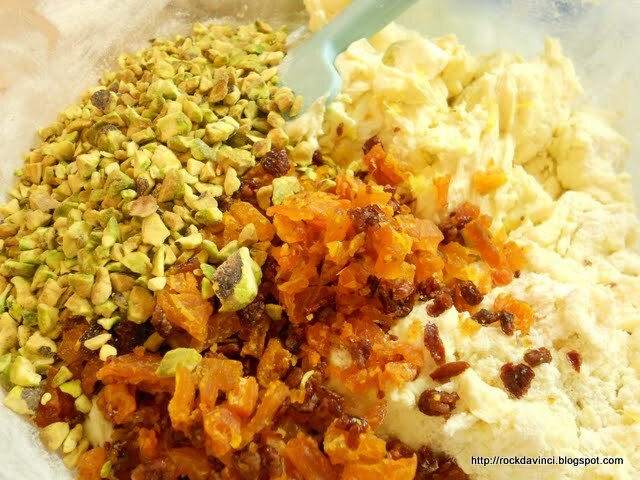 It contains chopped roasted (raw unsalted) pistachio, dry apricots, raisins. Some are dipped in semi-sweet chocolate and roasted almond slices. Line a half sheet baking pan (18x13") with silipad or parchment paper. Shift the flour and baking powder in a medium bowl. 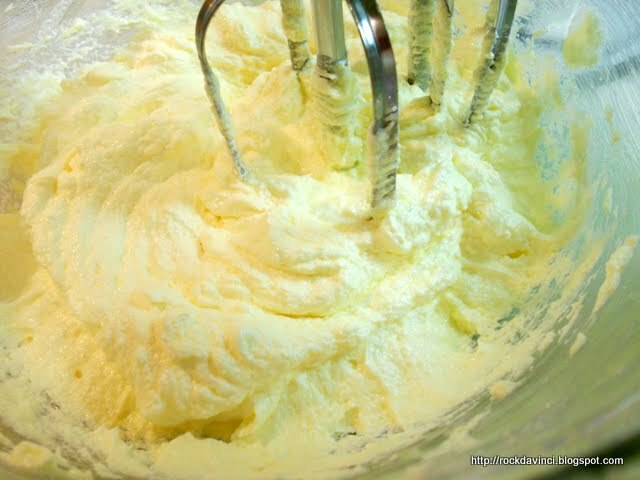 Beat sugar butter and lemon zest, salt, in mixer with paddle attachment until the butter is fluffy and pale in color; Add 1 egg at a time and after well mixing in the first ones. 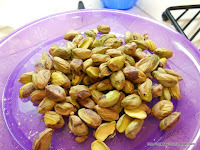 Stop and mix in pistachios and other goodies of your choice. Use the spatula to incorporate them well. 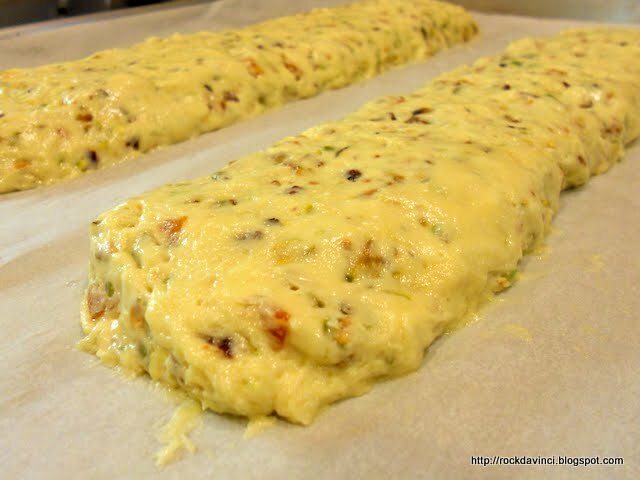 Form the dough into a 13-inch long, 3-inch wide log on the prepared baking sheet. 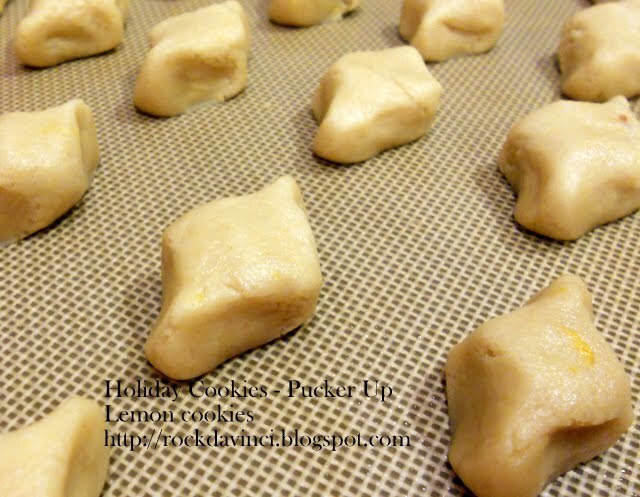 Bake until light golden - *depending on your oven-- about 40 minutes. Cool for 30 minutes. ** You are not done, yet. Place the log on the cutting board. 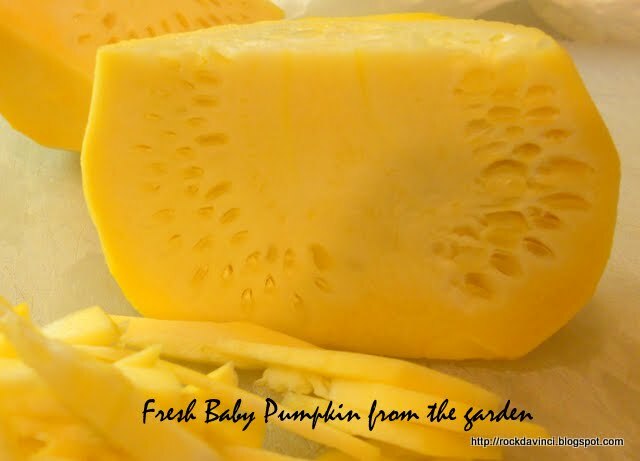 Using a sharp serrated knife, cut the log on a diagonal into 1/2 to 3/4-inch-thick slices. 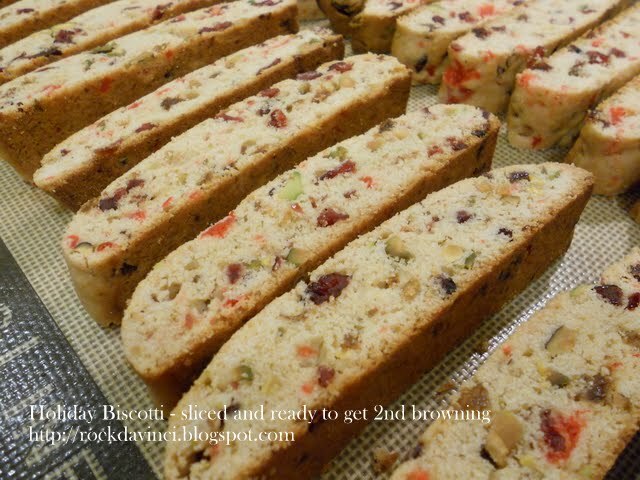 Arrange the biscotti, cut side down, on the baking sheet. Bake the biscotti until they are pale golden, about 15 minutes. Transfer the biscotti to a rack and cool completely. 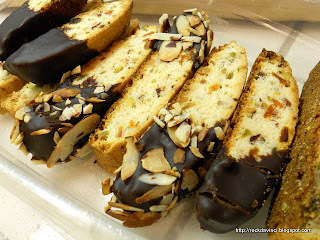 Dip half of the biscotti into the melted chocolate. Gently shake off the excess chocolate. 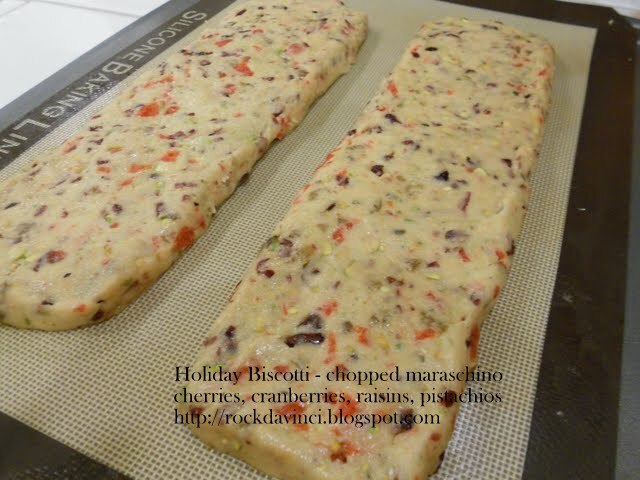 Place the biscotti on the cooling rack set over a parchment or wax paper to catch the excess chocolate for the chocolate to set (you can reuse the chocolate after it becomes solid again). 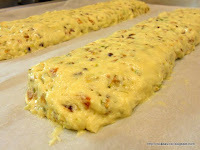 Roll in almond sliver before the chocolate solidifies or sprinkle with sprinkles or sugar crystals. Let it set until the chocolate is firm, about 35 minutes. Wrap them up individually or in a holiday-ish container and share with friends and family. 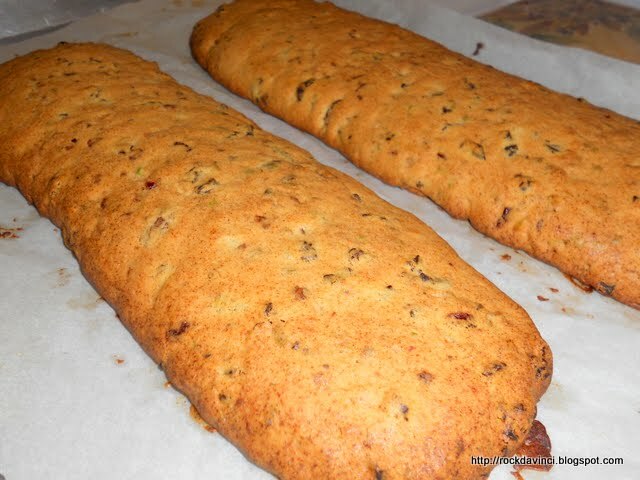 This is the follow up of the Challah with Raisins. The Challah turned out as flavorful as the first Challah with Cranberries and Raisins. The dough developed very well, and it is very tasty. This is definitely a winning formula. 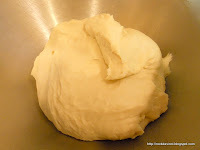 Instead of making on large Challah, I divided the dough into two. One for my sister and one for me. This is my adventure with Asparagus. The dish turned out quite appetizing to eat GENZIMAI 'brown rice' with. But the rice vinegar flavor is a bit overpowering. Will improve on the sauce the next time. In fact, tonight, I made creamy mushroom sauce with shallots with Provence spice for the Asparagus spears sauted in clarified butter. 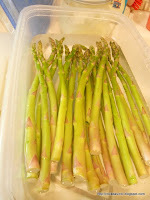 It was heat through for 1 minutes and found out that it was 30 sec too much for the beautiful green asparagus. It got overcooked. Glutinous sweet rice taste wonderful steamed. Normally, the ground pork is used to make this dish, but I ran out of it, so I tested with shrimps. Taste??? well, it's missing something, I am not sure what. I will have to improve on it. Maybe a dab of fat pork would do? 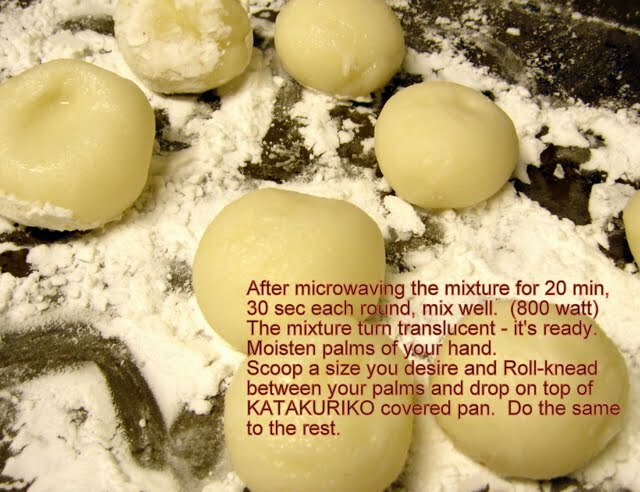 Form the grounded shrimps into a ball and roll it in glutinous sweet rice. 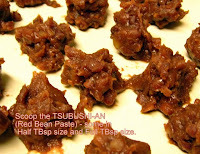 *The sweet rice is wash thoroughly till the water is clear and soaked in water for 30 min, then, strained well before use. (but not dry). After an hour, turn off the rice cooker. Wait 10 min. 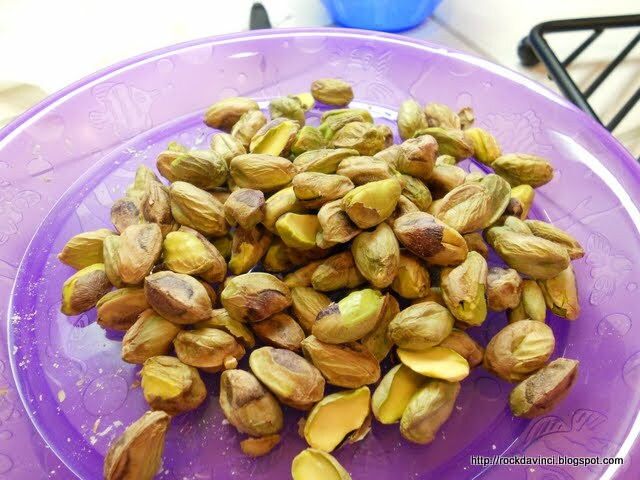 Then, open the lid carefully not to let the steam rain down on the pearl-balls. Set the lid on the lid rester. 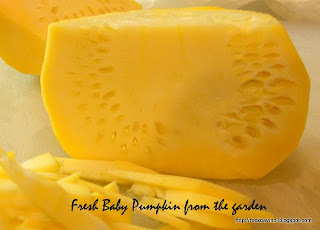 The sweet rice should look all translucent. If your rice cooker has a glass lid, then, just check for translucent rice all around. I rather cook it long enough to make sure the rice is cooked and internal meat is cooked through. 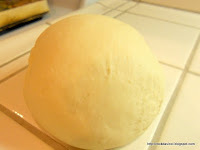 Uncooked rice is challenging to recook once the heat is turned off; and it usually require additional water, and there is a consequence of rice turning 'mushy'. The next day, they turned into my BENTO in mini-cupcake cups. 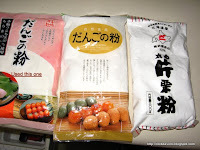 Will There Be a Lots of UME Growing This Year? 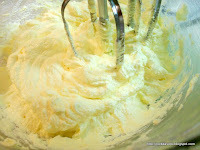 Buttermilk Biscuit Testing - Butter or Shortening or Lard? My Croissants - Any way you look at it, C'est si bon! Polly's Jiane Bien - Fried Meat Filled "Cake"
Trois Fruits Tatin - A.P.P. Canneles de Bordeaux - Delicious! Watermark theme. Theme images by Synergee. Powered by Blogger.